Ta-ching’s Google voice number automatically transcribes all incoming voice mail. Apparently, I do not know how to enunciate and I have nicknames for everyone. Also as proven by many interviewers over the phone, I slur my words. Here is an example voice mail from today when I was demanding (or requesting) that Ta-ching pick me up from the caltrain station at 22nd and Pennsylvania at 6:37 pm. I was crossing a busy street during the mid-point of the voice mail as a bus roared by. something up so have a nice for no an email the bye. Note: The scavenger hunt is over (a concluding post will come soon) and we got second place out over 300 teams! 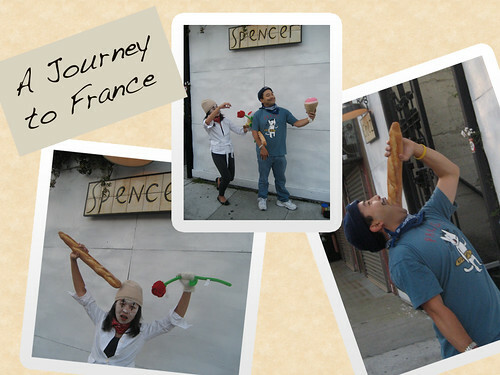 This is a series explaining the background and thinking of our missions of the SF Street Food Scavenger Hunt! The Mission: Create a postcard showcasing an American classic with a special ethnic spice. Look for a cart that would make Buddha happy. We figured out quickly that it was alluding to a hot dog with kim chee—a Korean hot dog. The site said that it was not located in the mission, but somewhere else. Using Yelp, I figured out that it was in Golden Gate Park. So on a free day, we headed to the Golden Gate park following the comments we analyzed to locate the Happy Belly stand somewhere near the entrance of the De Young Museum. Chris dropped me off and I ran around the square in my heels and dress (I was dressed as Korean spice)…and holding a huge Mashimaro. It was insane. I couldn’t find it and I was surrounded by gawking tourists wondering why I was wearing a slightly revealing purple dress with a huge Mashimaro in my hands. Did I look like a Korean? Maybe. Fortunately though unlike walking around Tenderloin, I didn’t receive any unwelcome comments. The only comments were from a group biking that loved the “stuffed animal” and greedy stares from little kids at the large bunny in my hands. Eventually, I found Chris who was still looking for parking. He was dressed in American classic with a baseball jersey and hat…and a baseball bat. We called the restaurant who started the Happy Belly stand and unfortunately the stand had closed for several months. What happened to this word play testing? 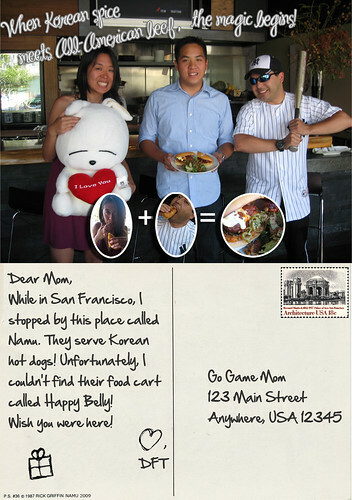 So we headed to the restaurant Namu instead…and try to see where the Korean hot dog was. Apparently Happy Belly was only in San Francisco on Thursdays at the Ferry Building. ugh no go. I wanted to complete this mission asap. And about 30 minutes later, we had the Korean hot dog. We asked the host to take the hot dog…with us. As we took the picture, we got hoots from the chefs about Yankees. Red Sox was definitely in the house. A few days later, I got time to photoshop. I searched around google for the appropriate images and fonts…and assembled the photo as below. On the Korean hot dog? Yes, it was definitely amazing. But I say a Korean taco—a flavor of Asian and Mexican—beats Asian and American any day. After doing the Chicken Dance video, I headed back to the Mission via the J taking the long route home. On the way, getting off at 18th and Church, I passed by Bi-Rite. Chicharrones! Of course, I never had it before. 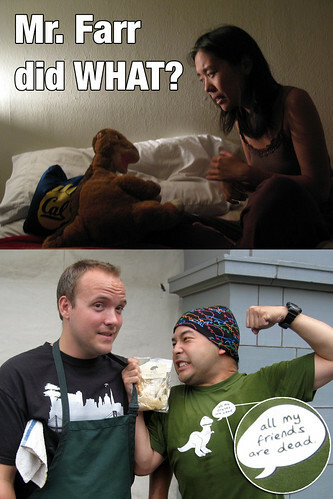 But I knew from some teams’ initial photos with the 4505 Meats man that he sold chicharrones at Bi-Rite Market. I immediately stepped inside. In preparation for Obvious Tourist mission, I picked up French bread. Then I wandered throughout the small store looking for this thing…called chicharrones. I had no idea what they looked like…dried meat? Were they like beef jerky? I had a confused look on my face until someone asked me if I needed help. I stuttered out the word chiiiii-ka-ROANS? The guy tapped another guy…who rolled his R’s as a native Spanish speaker…oh chikaaarrrrones? He finally had to lead me to the display and point to the bag. Oh, thanks! I said gratefully. They were $2.99 even though you could get a huge bag of them for 99 cents at the Walgreens around the corner from my apartment. The small bag sat in my apartment for a week as I contemplated what to do with them. Me sitting down with a plate of chicharrones and a plate with the plush hambone? Too basic and uninventive. Then Chris was sent to the Thursday Ferry Building Farmer’s Market to meet Ryan Farr. He was wearing his favorite t-shirt. That night, I had a talk with Littlefoot and thus the resulting photo appeared. The caption is: DINOSAURS ARE FRIENDS, NOT FOOD! The day after the street food festival, I finally opened the bag that was now somewhat crushed. I took a bite not sure what to expect. It was like the rice crackers with Chinese peking duck…but it was spicey…flavorful. I drank water immediately. Chris loved it and I told him to eat the rest. The Mission: Show some love at the El Tonyanese Truck. 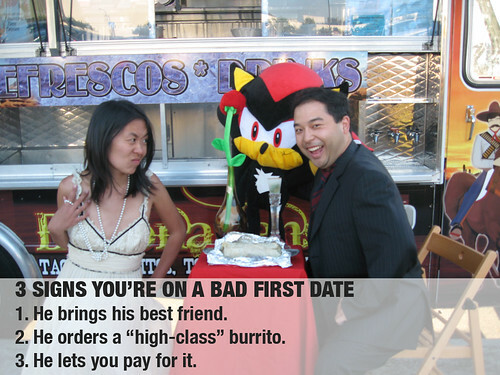 Buy a burrito and show some romance! Ultimately, we took a safe approach. Perhaps having a romantic dinner in front of the taco truck with candles, my plush rose and a nice silver serving plate. But right before leaving for the taco truck, I checked the website and it turned out another team Hungry Bears Love Salmon uploaded something similar. I came with an idea that Chris would bring an extra friend. The huge Shadow that Chris had dragged all the way from Mountain View. In my own awkward way, I described the detail of how the photo would end up. He had a friend…and I would be unhappy about it. We did a quick rehearsal with our equipment setting it up with my plush rose inside a vase we got from Mike Lauren, a silver platter and a glass candle holder with candle that did not fit. We took a bar stool, my mini stool and a folding chair stuffed it into the car…and drove over to Harrison. I knew there were three trucks to choose from since I regularly pass all three on way home while biking down Harrison. The first two—one at 20th and another at 18th—we deemed too quiet and with too much low light. We stopped at the one near Best Buy and Chris pulled into the Best Buy parking. Then we grabbed a shopping cart and quickly loaded it with our equipment. At the taco truck, we ordered a burrito with carne asada. I paused for a moment, not quite sure how to explain exactly what we were doing. A guy started talking to us about burritos in LA…how it was much better down there…and that this truck was the best burrito in the Bay Area. As he told us about his Hummer, we set up…and asked him to take the photo. People inside the truck laughed…and other people around us gawked at the sight of us dressed up and having a “romantic dinner” in front of a taco truck. So I made my face while Chris held Shadow close with a great grin. The most difficult part I found was trying to make sure the camera caught my face. We had the guy take 4 photos trying not to let the disappearing light affect our photo. Shortly afterwards, we rushed back the equipment into the car. I hope my roommate didn’t notice that I took the bar stool out into the parking lot of Best Buy. It’s a sad sad sad thing. But despite living only a few blocks from the bacon hot dog cart for almost 3 years, I had never had a taste. 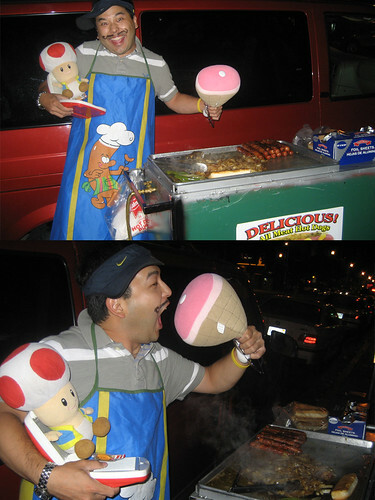 Before going to Thailand, the idea of buying street food for some reason never really appealed to me. Thoughts of oh it’s probably not good just swirled inside me. About a year ago, as we were passing the cart, I asked how much it was. $3. I was appalled thinking that it should be less…like $1 or $2. But I didn’t return until that fateful evening a week ago. Two weeks before, I purchased bacon on a whim. I had accidentally bought a huge bag of prunes for $4 at the farmer’s market. The lady waved me in…prunes…only 4 dollars! I am not one to ever refuse fruit and I took it greedily handing over 4 dollar bills. But then what to do…an idea popped in my mind…wrap it with bacon. At the BBQ later that day, my bacon-wrapped prunes were a hit for my friend’s surprise birthday. We ended up wrapping everything in bacon. At some point, I realized how unhealthy…and moreover, how unorganic (the pig probably wasn’t treated well) it was. I was intrigued. Take a photo behind the bacon hot dog cooking equipment. Chris found his sausage apron. I got our toy George Foreman Grill and found a gummy hot dog to emulate our photos in 2008. When you press on the George Foreman, there’s a sound effect of sizzling! And so we found the guy on Mission near Medjool’s. We asked to take a photo…and he obliged. Laughing as he did so from his van. He said something to another woman inside the van in Spanish as Chris made expressions. And there it was…our bacon hot dog photo! I will gladly pay you Tuesday for a bacon wrapped hot dog today. Last Saturday, I woke up knowing that I had to do it. There is a little bit of OCD inside me (despite all the partially completed projects in my life) that said I have to finish this. I must do my best. I must do it even though I will fail. Do a funky chicken dance with your team at the Roli Roti truck at the Ferry Building Farmer’s Market. Capture it on video. Truth to be told: I had never done a chicken dance. Apparently the weddings I have been to…either the bride and groom did not enforce dancing for the guests….or that the bride and groom did not subject the guests to such inane activity. 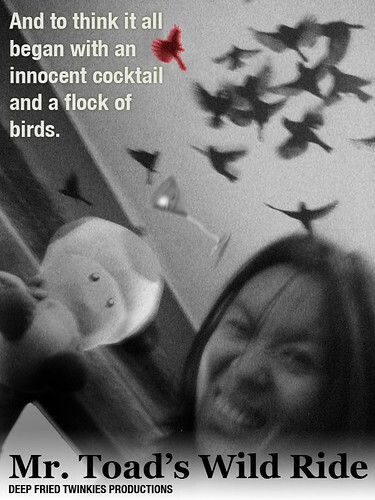 I finally convinced ta-ching to meet me at the Ferry Building after some rampant posting on twitter and facebook. Seems like social media doesn’t help me much for these kind of requests. Ta-ching refused to participate, but he willingly recorded me doing the dance. As I did it…I was overcome with anxiety and went on autopilot. Apparently with a big smile on my face because I thought I was being silly. Is everyone staring??? 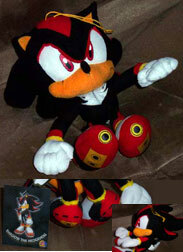 I ran off the stage as soon as possible. When reviewing and editing the video, it turned out that…nobody even noticed. Nobody stared. Nobody looked. After all, some people would be used to people not…doing normal things in this grand city called San Francisco. The final chicken dance! Vote for us! Having had slept at many places in the last 10 years, there are times when I wake up that I am disoriented. The room is darker…or lighter. The bed feels different—sometimes better, most of the time, worst. On Sunday, I tried sleeping backwards. My feet where my head usually is. My head where my feet usually lie. As the night quickly fell, I shut my eyes and drifted away. When I awoke to my roommate’s footsteps, I opened my eyes. Blind, nearsighted blurriness. But disorientation? Not at all. My memory of sleeping backwards flooded back…quickly. I wonder though if there was a murderer…a psychokiller…would he pause in confusion when he opened my room to find that my feet are at the head of my bed? Would he still shoot in cold blood murder? Or comment on the situation…then shoot? Or laugh in absurdity? 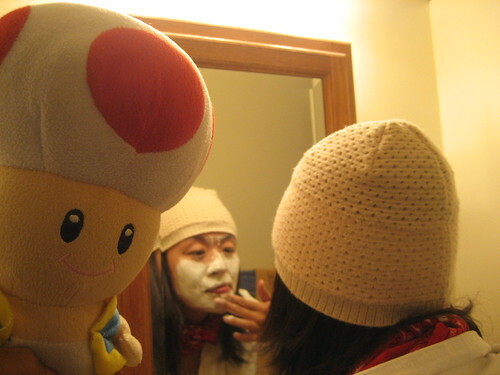 Then I thought about putting baking powder on my face. In doing the street food scavenger hunt, the latest task was to incorporate the ceiling of a local bar in a photo…into a movie poster. Unfortunately on that evening, I did not understand what the actual mission was. Just that a photo needed to be taken with the ceiling. 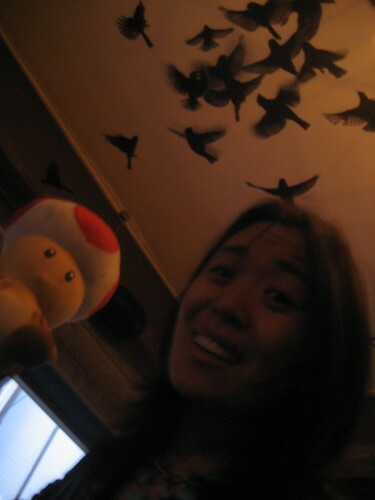 So I took Toad with me and asked Ta-ching to take a picture of me with the ceiling, Toad and me. There was something strange about heading into the dark, dim bar on Folsom. I had just come from rolling from Chez Spencer on the Go. Feeling dim-witted and obnoxious, I sauntered into the bar looking for the easy way out to accomplishing the mission. I hurried to a dark corner where nobody was sitting and took out my props. Creation on the spot was impossible, but I tried to do faces as I held up toad toward the birds. And ta-ching held the camera steady as I felt ridiculous in front of the bar patrons who glanced over at us…sporadically sipping their expensive cocktails. The cocktails that I didn’t know that I was supposed to order.